While summer time is the time for vacations and fun, it also usually means record temperatures, limited rainfall, and peak water demands for the cities of the northern Panhandle. In order to help cities conserve water during this difficult time, the cities and the district have combined efforts with local media outlets to present Operation: Summer Showers. Operation: Summer Showers is a program to provide residents with conservation tools and information to show them how they can save water in their everyday lives. Operation: Summer Showers is intended to address water conservation issues related to lack of showers outdoors and the high percentage of water used for showering and other household uses. Lawn watering is the number one domestic use in the summer, while showering, laundry, and other uses indoors account for most of the domestic water use year-round. Low Flow Shower Head- According to the EPA, replacing your regular shower head with this low-flow design can reduce your usage as much as 2,300 gallons per house hold per year. Use the “Soak and Soap” button to turn the water on when you’re soakin’ and off when you’re soapin’. Rain/Sprinkler Gauge- Measure the moisture that goes on your yard to make sure you are applying no more than one inch per week, including rainfall. Drip Gauge- Use the drip gauge to measure the amount of water wasted because of a leaky faucet. An average of 10,000 gallons of water is wasted per year in every household because of leaks. Check ’em and fix ’em. Leak Detector tablets- Drop one in the toilet tank. If the dye shows up in the bowl, you’ve got a silent leak that needs repaired. A leaky toilet can waste 70,000 gallons of water each year. Water Bottle- Refillable water bottles will cut down on the number of glasses to wash. Keep your bottle in the refrigerator to keep it cold. Pictured above is an example of an Operation: Summer Showers kit from 2017. 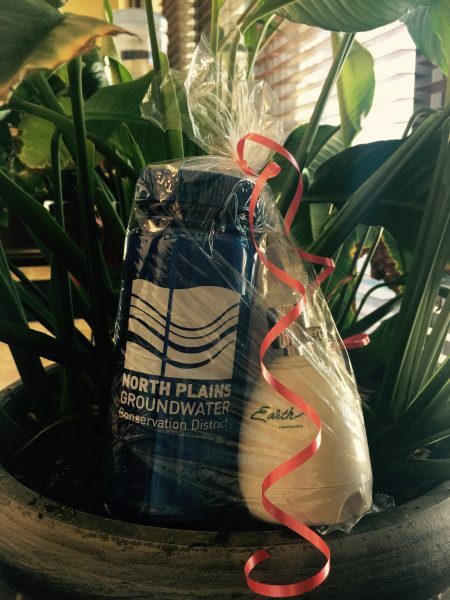 The free water-saving tools are available during the event at locations throughout the District including the North Plains Groundwater Conservation District Office at 603 E 1st Street in Dumas and at City Halls in Booker, Spearman, Stinnett, Stratford, Dumas, Dalhart and Perryton. For more information on Operation: Summer Showers call the district office at 806-935-6401, or email kwelch@northplainsgcd.org.